Edithrose Moyo is a para social worker who connects children to local health services. Photo courtesy of AIHA. Temeke is one of the poorest districts in Dar es Salaam. For people living there, it is difficult to know where to turn for health services, so community-based social service workers play a crucial role in identifying people in need and linking them to a broad range of psychosocial care and support services, as well as to medical care. Edithrose Moyo is one of those community-based social service workers. She works in the community to provide care and support to the growing number of children who were orphaned by the country’s HIV/AIDS epidemic or made vulnerable by abusive situations, disease, or abject poverty. 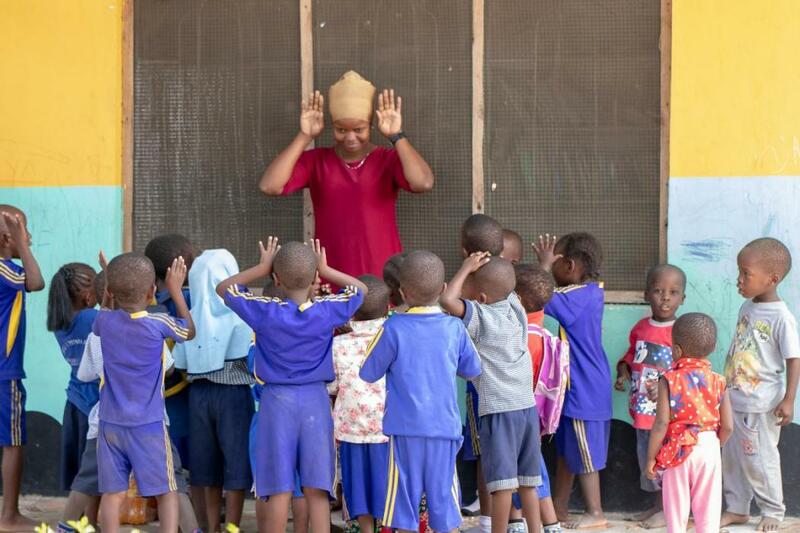 Moyo currently works with 35 children. And over the past 14 years, some 400 children have been supported through this program. “The children we work with are in really terrible situations. Most medical and social service providers do not come to remote areas of the city like this; and it is a big challenge for people to access care and support,” she explains. “We help where we can, whether it is providing food, clothing, school uniforms, fees for books, or accommodations. We also try to link people with other organizations that can provide assistance that we cannot, including healthcare services,” Moyo states. She has also made arrangements for nurses to visit the children she works with on a regular basis to provide essential health services to the children. “They examine the children and provide wellness check-ups and vaccinations. They also treat any ailments the children might have, test for HIV, and make referrals to a health center if need be,” she says, admitting that this is likely the only link to the health system these kids have ever had. Moyo trained as a para social worker so that she would be better able to support the children’s needs. Because of the training, Moyo says she’s better equipped to assess the needs of vulnerable children and help them get the care and support they need. The program provides pre-school lessons to children between the ages of 3-7, teaching the youngest basic self-awareness and hygiene, as well as a lot of singing and drawing. “I think the case management skills I learned have really helped me adopt a more organized approach, including knowing how to link children to the health services they need,” Moyo states. Recognizing the critical role social service providers play in case management of vulnerable children and families—especially in underserved communities like Temeke—Tanzania’s Ministry of Health, Community Development, Gender, Elderly and Children has developed National Guidelines for the Provision of Psychosocial Care and Support Services, along with standard operating procedures to ensure uniform provision of psychosocial support services at the individual, family, and community levels across the country. In conjunction with Tanzania’s strong task sharing policy, these guidance documents are helping to address some of the isolation, stress, trauma, stigma, and discrimination that vulnerable populations such as the children Moyo works with often face. The Para Social Worker training Moyo attended was implemented by the American International Health Alliance through its HIV/AIDS Twinning Center Program with support from the U.S. President’s Emergency Plan for AIDS Relief (PEPFAR), the U.S. Department of Health and Human Services, Health Resources and Services Administration (HRSA), and the U.S. Centers for Disease Control and Prevention (CDC).